Two weeks ago I started researching backpacks that would be good for walking the Camino. I was going to wait until the end of the year to buy a backpack, or put one on my Christmas wish list, for I have been a very good girl this year. However, now that I have a date set for my first Camino in May 2016, I am anxious to do practice hikes to test the gear that I’ll take. I love a good deal, so I checked out the REI Outlet website first and ordered four backpacks to be delivered to the Berkeley store. I figured I can try these packs out on-site and also get measured and fitted by the expert staff. 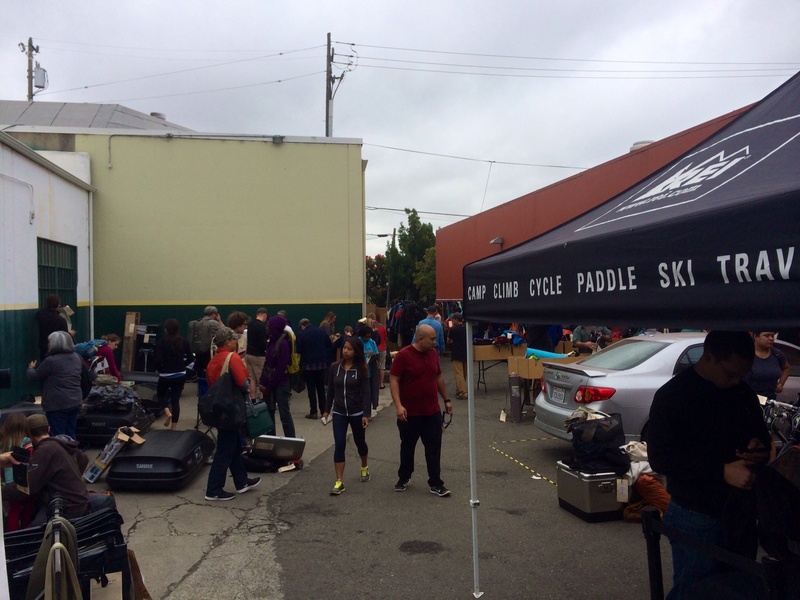 The day I went to REI for pickup was also the day they had their members only used gear sale outside in the parking lot. What perfect timing! 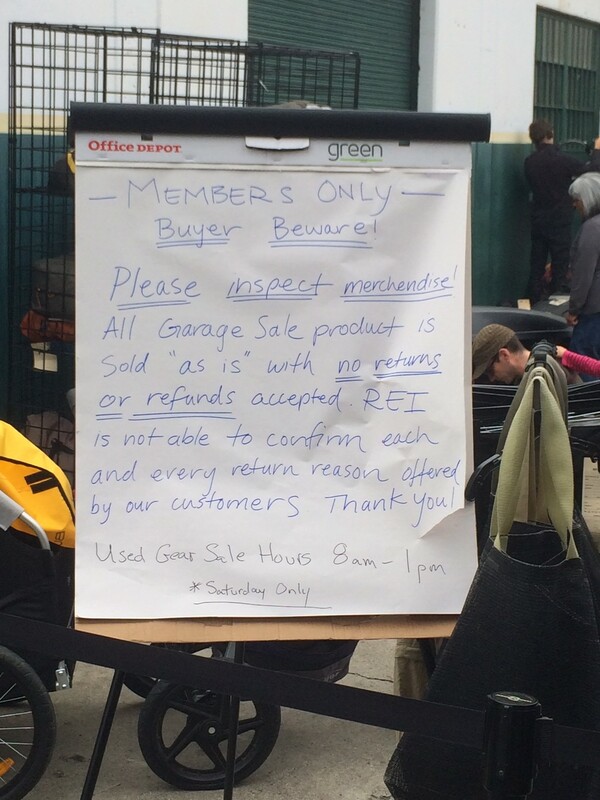 When I arrived around 8:40 am, there was already a long line, so I waited half-an-hour with other deal seekers. When it was finally my turn to enter the sale, I was hoping that one of those pricey Osprey or Gregory brand backpacks I’ve been curious about would magically appear in the piles of backpacks I rummaged through. While I did see a few of these brands along with many more types of backpacks, I didn’t have a clue what size I really needed. I asked an REI attendant about sizes and he did a quick measurement from my hip to my shoulder. He said my torso was 15″ so that would be between an Extra Small or Small in women’s backpacks sizes. What?!? I was stunned. I am 5’5″ and XS has never been on a label in my wardrobe! He said when it comes to backpacks, it’s not about height, it’s about the length of the torso. He too was surprised when he learned that he should use a men’s Medium size backpack even though he is 6’3″. I thanked him and started my search for a S or XS backback on the tables. Slightly dismayed, and tired of looking through the piles, I moved inside the store, empty handed. At least I had a good caffeine buzz, thanks to Allegro Coffee Roasters and Whole Foods for their tent with free coffee and pastry for the early risers at the garage sale. To mimic a fully loaded backpack, Zoo showed me how to stuff the packs with a pillow on the bottom and ten and five pound beanbag weights at the top. I stuffed and tried all four outlet packs, but the only pack that was small enough to fit my frame was the REI Stoke. I wasn’t crazy about the lack of shoulder strap padding, or the boring grey color. Luckily there was a great variety of backpacks in the Women’s 1-3 Day hike aisle. Zoo went on a much deserved break and a young woman named Hunter came to show me other packs she thought I’d like. I was feeling grateful to have Zoo and Hunter (so Berkeley!) answer my questions and show me how to adjust everything. Although they hadn’t walked the Camino, they both were familiar with the trek and have helped fit many peregrinos for their backpacks. Unfortunately the Osprey Tempest 20 wasn’t available in the XS/S size. Out of the four I tried, the most comfortable was the Deuter. I remember seeing this brand on the many Germans traveling in Sicily when I was there in May with my husband. I wasn’t swayed by the cute yellow flower adorning the Deuter, and Hunter was a little concerned about the shoulder straps rubbing my arms as I walked. I continued my search until something caught my eye at the end of the aisle. She’s a real beauty in Tahoe blue and even comes with a rain cover, which I’m sure will come in handy in Galicia. Hunter wasn’t familiar with this model as it is new (there aren’t even reviews yet on REI.com), but I checked it out and really liked everything about it. Most of the backpacks I tried had a top drawstring opening for the main compartment. The REI Traverse has a zipper that allows it to be opened up from the side and top, allowing for a big wide opening. I think this will be easier for me to see inside instead of digging down into a pack from the top and having to take things out to get to stuff at the bottom. I found the Small size, stuffed it with a pillow and 15 pounds and tried it on. After I made all the adjustments that Hunter showed me, this backpack fit me the best of all. I felt like Goldilocks finding the perfect chair! I walked around the store with the pack fully loaded to get a feel for it. Hunter remind me about the REI return policy and said that I have up to a year to try equipment out and they’ll take it back and offer a full refund if I’m not satisfied. After seeing the items in the garage sale, some gently worn, and some with stains and holes, I felt confident that I have nothing to lose with buying a backpack from REI. I returned the four outlet backpacks in exchange for the REI Traverse and came out ahead with a credit. 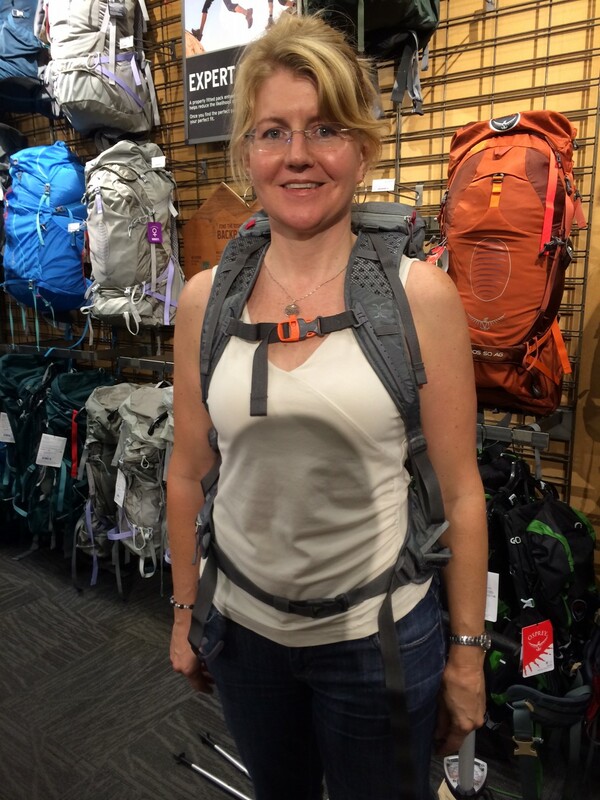 Thanks to Zoo and Hunter at REI Berkeley, for guiding me on my quest for a Camino backpack. I look forward to testing it on the trails. UPDATE: See Gear Reviews for a follow up of these and other Camino backpacks. Hi Laurie, Congratulations! Your story reminds me so much of when I bought my first back pack at REI. I, too, remember, many years ago, trying on countless backpacks which seemed to take forever and a day! Because of a sensitive back, I ended up with a framed backpack which has served me well all these years but it’s been a couple of years since I last backpacked. I now expect to see you on the Railroad Trail with your “blue” backpack on. Hello Laurie, thanks for following my blog. I have an osprey 33 liters and it is perfect for me. I’m 5 feet 2 inches and weigh 110. I should only be carrying 11pounds but I’m carrying 16 and it feels fine for me. I only fill my camel to one liter each day and that is plenty. Hope you have found the perfect pack for you. I hope to keep my pack around 13 – 15 pounds. REI’s satisfaction guarantee is great. It’s nice to know you won’t get stuck with expensive gear if it doesn’t work out. The other thing is that they are very accommodating, so when I’ve purchased backpacks from REI in the past, I’ve brought ALL the stuff I’m planning to carry in the pack into the store with me — clothes, gear, food, water — EVERYTHING. That way you compare how your stuff will fit in the different packs, how you might organize things, and you can also feel the weight of your actual gear in the pack. For some reason, your actual gear always rides a little different from the equivalent weight of pillows and bean bags! I hope your pack works out! Buen Camino! Eric, thanks so much! That is a great idea to bring what you will pack into the store for a true test. While I have some idea about what I’ll bring, my packing list isn’t done yet. I don’t know if I’ll bring a sleeping bag or a liner for Camino Portuguese in late May. Laurie, my wife and I are considering walking the Camino Frances in April/May of 2016. Like you, we haven’t decided whether we need sleeping bags, but I am leaning toward taking one. We are also considering sleeping “quilts”, like the kinds ultralight backpackers use — they are sort of a cross between a sleeping bag and a blanket, and they are a bit lighter than sleeping bags. I still have some research to do on that. Here’s one that weighs about a pound: https://www.backcountryedge.com/index.php/big-agnes-kings-canyon-ul-quilt.html?gclid=CPvRo6HEq8cCFVNufgod5wcC5w Unfortunately, not available at REI. The author of this website and the Walkabout books describes certain walking routes in California where you can hike from inn-to-inn. A lot of the routes in the Northern California book are centered around the Bay Area. You don’t have to carry camping gear, because you are staying each night in an inn, and you can eat at the inns or in restaurants, so the load you carry is a lot like what you would have on the Camino. My wife and I are thinking about trying a few of these routes to see what it is like carrying the Camino pack and living with the minimal stuff for a few days. plus it sounds like a lot of fun! We are looking at the Point Reyes trip or the SF to Half Moon Bay trip. Marin Headlands looks good too, but the hikes are a bit longer and more elevation change, so maybe we’ll save that one for later. I picked up a copy of the book at REI. I have a follow up field test review coming soon, along with more backpacks from REI. The quest continues! Here is the field test, finally! Thanks for your patience.